Queen Euraxia Tharn was the Imperial queen of Rimmen during the Interregnum. Euraxia hails from the royal House Tharn of Cheydinhal. Euraxia had become the strict ruler of Rimmen following an event known as the Frostfall Coup in 2E 576, where her militia, known as the Euraxians conquered Rimmen, and she proclaimed herself as Queen. 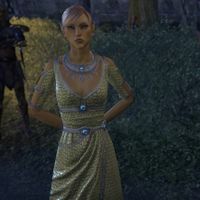 She was the mother of Javad Tharn, who led an invasion against the region of Reaper's March, but was defeated by forces allied to the Mane of Elsweyr in 2E 582. 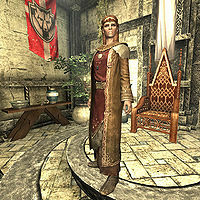 She was also the half-sister of Abnur Tharn, chancellor of the Elder Council. This page was last modified on 9 April 2019, at 13:35.